The Confederated Tribe of Warm Springs consists of the Warm Springs, Wasco, and Paiute tribes. You’ll find their reservation and quality museum 56 miles north of Bend. The Warm Springs bands lived along the Columbia River tributaries, moving between winter and summer villages, as they depended on game, roots, and berries. Although their language and customs differed from the Wascoes, the two tribes could converse and had frequent trade. The Wascoes resided on the Columbia River where they survived by fishing. They traded often with other Indian tribes. They obtained roots and beads from the Clackamas. From the Warm Springs and Nez Perce, they traded for game, clothing, and horses. In return, the Wascoes provided root bread, salmon, meal, and bear grass. They and the Warm Springs still build and use scaffolds over waterfalls and use long-handled dip nets and set nets to harvest fish. 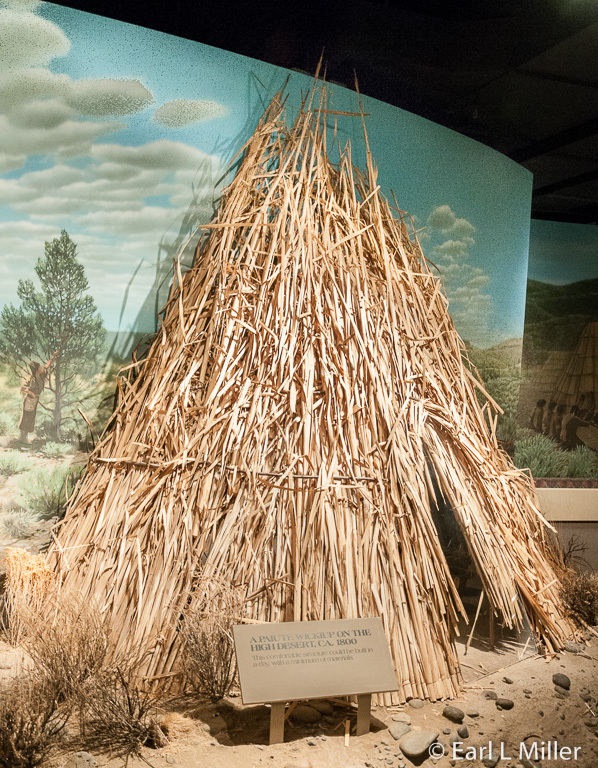 The Paiutes lived in southeastern Oregon, as well as Nevada, Idaho, and western Utah. They migrated further and more frequently than the other two tribes. Game, not fish, was the staple of their diet. Contact between them and the other two tribes often resulted in skirmishes, and trade was infrequent. During the mid 1800's, settlers started arriving in Oregon. In 1843, 1,000 immigrants passed through the Dalles, along the Columbia Gorge. By 1852, the number rose to 12,000 settlers crossing Wasco and Warm Springs territory. In 1855, Joel Palmer, Oregon Territory superintendent, was asked to remove the tribes from their lands. He negotiated several treaties including the one on June 25, 1855. It established the Warm Springs Reservation for the tribes exclusive use. In return, the Wasco and Warm Springs tribes ceded approximately ten million acres of land. They did keep the right to harvest game, fish, and other food on lands they had used outside their reservation. The current reservation is approximately 1,000 square miles containing 650,000 acres. The Paiutes arrived in 1879 when 38 moved to Warm Springs from the Yakima Reservation. Eventually more joined them. In 1934 Congress passed the Indian Reorganization Act (Wheeler-Howard Act). It authorized tribal incorporation as tribes could now write their own constitutions and elect councils. It provided Federal financial assistance to tribes organizing under the act’s provisions. The act expanded educational programs and gave preference to Indians for careers in Indian service. In addition, it encouraged Indian arts, crafts, and culture. The three tribes incorporated in 1937 as the Confederated Tribes of the Warm Springs Reservation of Oregon. They formally accepted a corporate charter from the federal government in 1948 for their business endeavors. They have become one not only by laws but by intermarriage as well. Currently, 5,000 Native Americans reside at Warm Springs. A mainspring of the economy has been based on providing power and forestry products. Warm Springs Composite Products builds bulletproof doors. Warm Springs Power Enterprises allows the confederation to sell electricity. Cattle raising is huge, and tribal members are working to bring back agriculture with the raising of such crops as alfalfa. Tourism is also important. 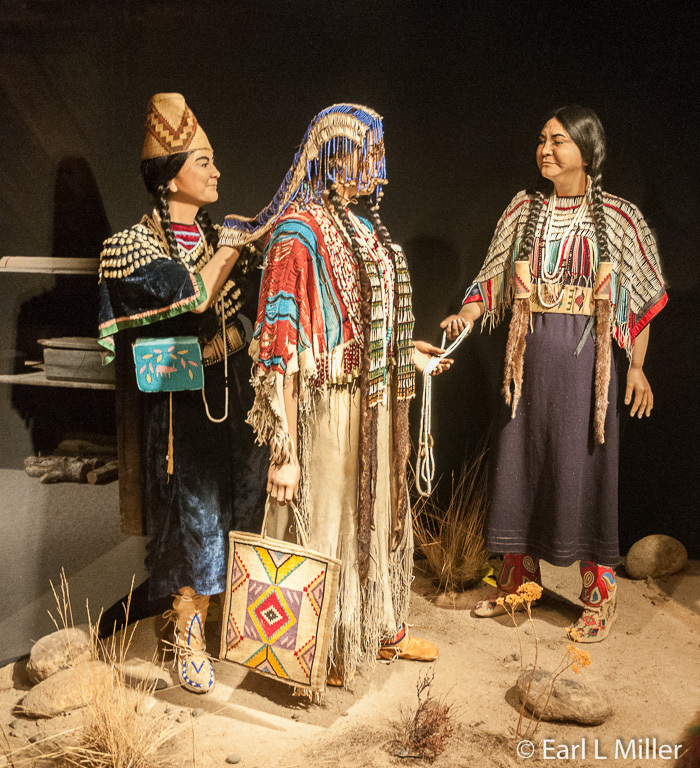 Kah-Nee-Ta High Desert Resort and Casino, Indian Head Casino, and the Museum at Warm Springs attract visitors to their community. The museum was developed as a way to protect the old ways from disappearing so the youth would know where they came from and who they were. 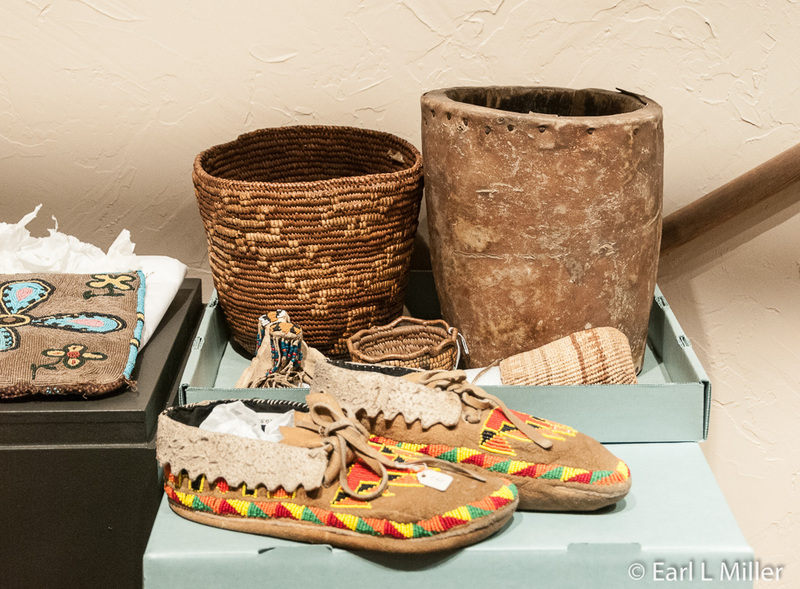 In 1968, the tribal leadership and community recognized private collectors and off-reservation institutions were buying much of their material culture. Soon afterwards, the Confederation started allocating $50,000 annually to purchase artifacts from Warm Springs tribal families. In 1974, the first charter and board passed under Museum Project Resolution No. 4084. But it took until 1987 to hire the first museum director. In 1988, a tribal referendum voted in favor of appropriating $2.5 million for the museum’s construction and later another $726,493 was added. This was the largest sum ever committed by an Indian tribe for a museum. 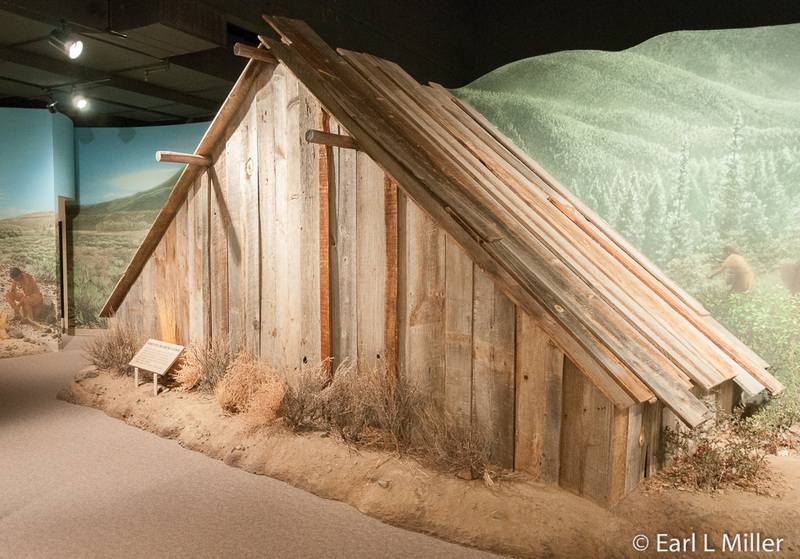 It was the first tribal museum in Oregon. Through grants, corporations, and individuals they raised more money to cover the final cost of $7,628,900. SM Anderson Construction Company Inc., out of Portland, started construction on May 7, 1991 with the grand opening on March 13, 1993. Another Portland firm, Stastny & Burke Architects, designed the exhibits. It won a Merit Award of Excellence from the American Institute of Architects. 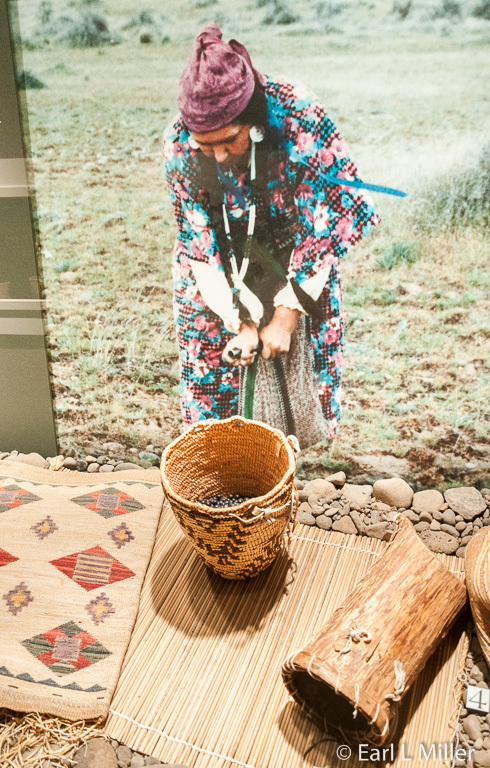 The museum’s purpose is to preserve the culture, history, and traditions of the Confederated Tribes of Warm Springs. Each tribe’s elders were asked to offer suggestions based on their historical perspectives. Symbolism is strong at this 25,000 square foot museum. Its exterior is arranged to resemble a traditional encampment among the cottonwood trees. It is located along Shitike Creek. Visitors pass an actual stream into a circular stone drum to a door with handles resembling featherlike bustles worn by male dancers. 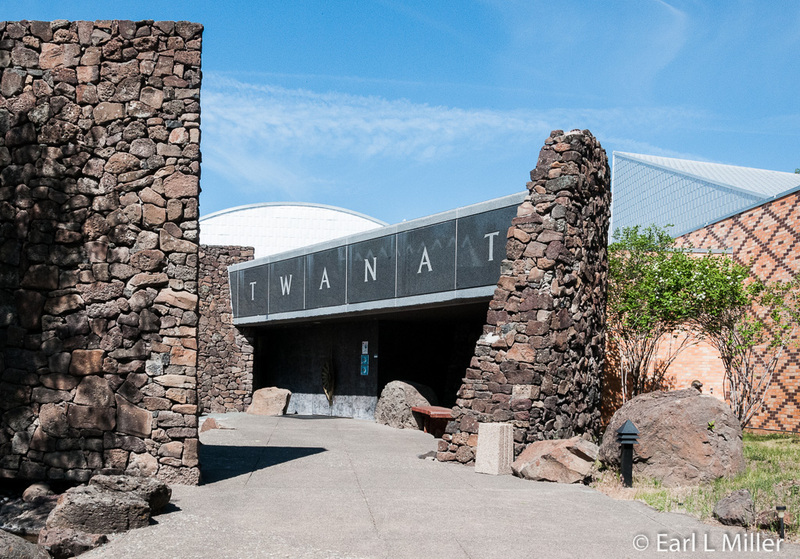 Over the museum entrance is carved the word “Twanat” which in the Warm Springs language means to follow. Inside, the vision of the stream continues onto a gray polished slate floor which creates a stream-like appearance. The architects used local stone, timber, and brick to integrate art into everyday life. 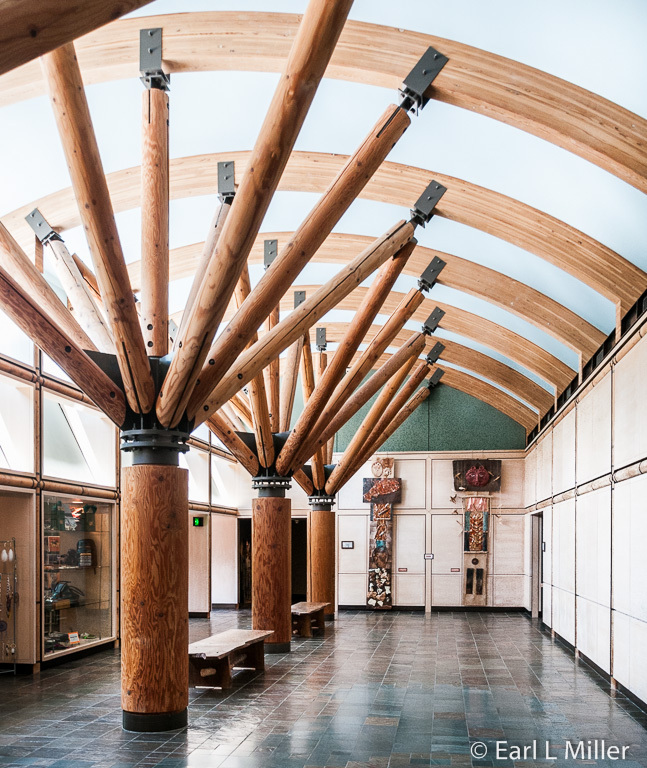 They used traditional designs and symbols in the building’s construction including a tipi, longhouse, and patterns of a Klickitat huckleberry basket (the brickwork). Inside, in the lobby, you’ll see huge columns of what were once tall native trees from the reservation. This is the entrance to the permanent and temporary halls with 10,000 square feet of exhibit space. They also have a gift shop, library/archive, education room, conference room, artifact collection space, and an administrative area. Outside, visitors find an amphitheater and an interpretative nature trail. The trail has kiosks on the geology of the rock formations of the valley and the wildlife native to the region. Collections are rotated throughout the year. It includes family heirlooms, trade items from other tribes, and keepsakes that have been passed from one generation to another. The museum relates on their web site that the Smithsonian Institute says, “Their effort represents, perhaps, the most aggressive program ever undertaken by an American Indian group.” Temporary exhibits change four times annually. The collection includes Pacific Northwest Native American paintings, sculpture, masks, ceremonial clothing, ritual implements, beadwork, and historical archives. It also includes 5,000 photographs dating from the 1850's to present times. The archives contain important tribal documents and a vast library on a wide range of subjects pertinent to their history and culture. Start your visit with the 12-minute introductory movie “Story of Our People.” It relates basic facts about the history of the tribes. Next, enter the permanent exhibit hall. At Stories, you can watch two videos. One is titled “Songs of the People,” a 19-minute film about the tribe’s creation, evolution, and destiny. The other is “Writing on the Rocks,” a 5-minute presentation about petroglyphs. You’ll come to an interactive called Tradition and Ceremony. There you will learn about tanning, a salmon feast, net making, and the gathering of berries. A display titled Elders explains their importance in teaching dances, songs, games, and ceremonies to those who are younger. Elders also teach the remaining tribal members how to be a community. A Timeless Heritage explains the early history of the three tribes. You’ll spot a Warm Spring summer home and a Paiute wickiup. One interesting interactive teaches you how to say in the languages of all three tribes - deer, my mother, and water. For example, the Paiute word for water is baa. You can enter a Wasco plank house, circa 1900, to view a wedding scene. Each part of the scene lights up as the audio explains it - for example, the groom’s costume, the bridal outfit, etc. The audio explains how the wedding meal is prepared and the role of men and women that day. There is gift giving. What surprised me is that if the marriage is not approved, a gift of a blanket with holes and food with mold may be given. 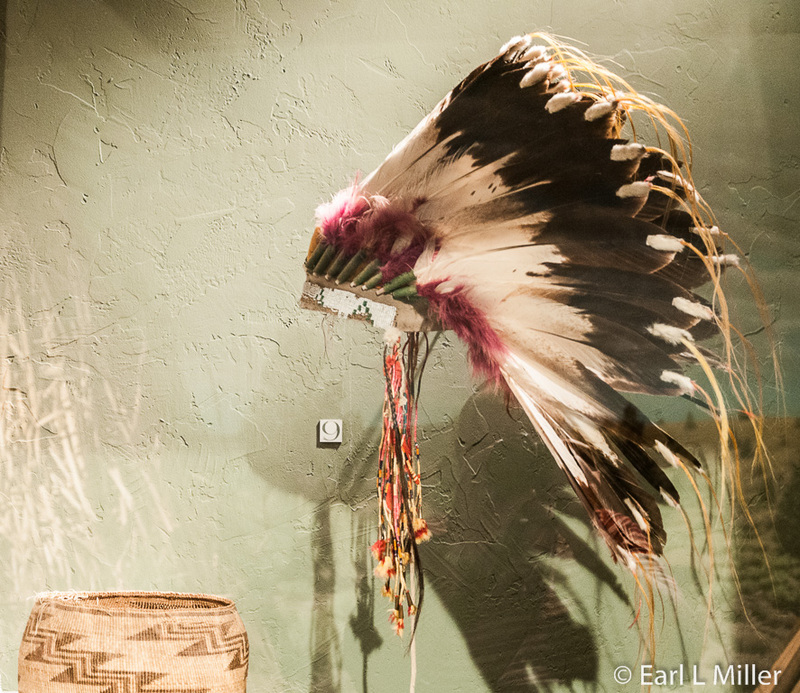 In lighted cases, you will find Indian dresses, war bonnets, Klickitat baskets, hemp and beaded belts, and beaded hats. One display is on how tribal members served as soldiers starting in 1866. 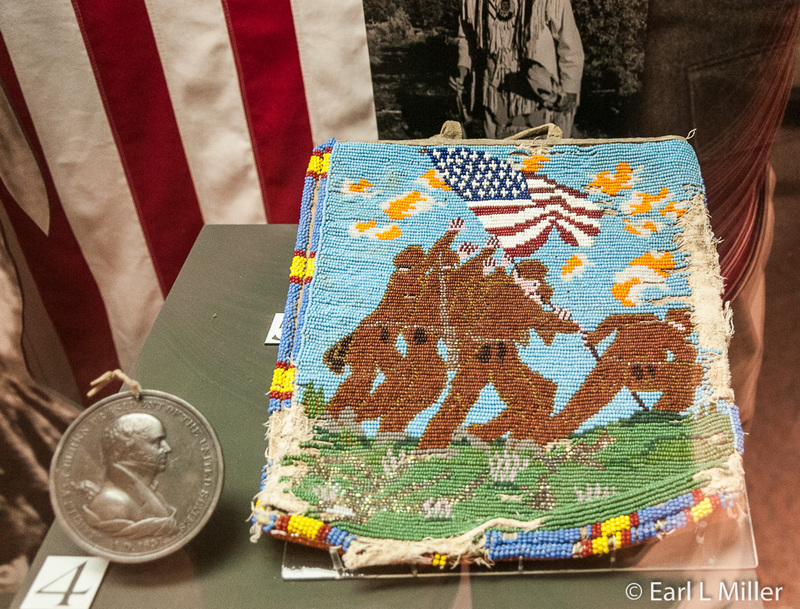 One beaded bag had the design of the Iwo Jima flag raising as one of the Marines present at that event was a Native American. Threshold of Change relates the incursion of the white man from when Lewis and Clark contacted them starting in 1805-1806. It describes how John Fremont surveyed the area in 1843, how 250,000 followed the Oregon Trail during the 1940's, and how in 1855 Henry Abbott led a party to find a route for a railroad line. It ends with the treaty in 1855 which moved the tribes from their home at the Columbia River to Warm Springs. The next section, Ceded Lands, includes an interactive. It speaks about how the treaty was ratified on March 8, 1859 and about the Paiute resistance from 1825 to 1870. They raided stock, fought settlers and other tribes, as well as soldiers and scouts, to keep control of their ancestral lands. They were defeated by General George Cook during the 1866-1868 campaign. They were interned for two years at Fort Vancouver before starting to return in 1879. This section also covers the Dawes Act of 1887. This legislation divided the reservation into 160 acres or smaller allotments. Land was held in trust by the government for 25 years with the purpose of turning Indians into farmers. The Indian Reorganization Act of 1934 overturned that law which had been a disaster for the Native Americans. The museum goes into modern history. It relates how roads and bridges have been built throughout the reservation and that housing is now Euro/American. You’ll see a board on tribal leadership and an interactive about their economy. The permanent exhibit closes with a video on Indian hoop dancing with hula hoops provided for those who want to imitate what they see on film. The temporary exhibit we saw was titled “Quiet Strength: The Art of Warm Springs Tribal Artist Travis Bobb.” It involved a variety of media including pencil drawings and closed June 7. 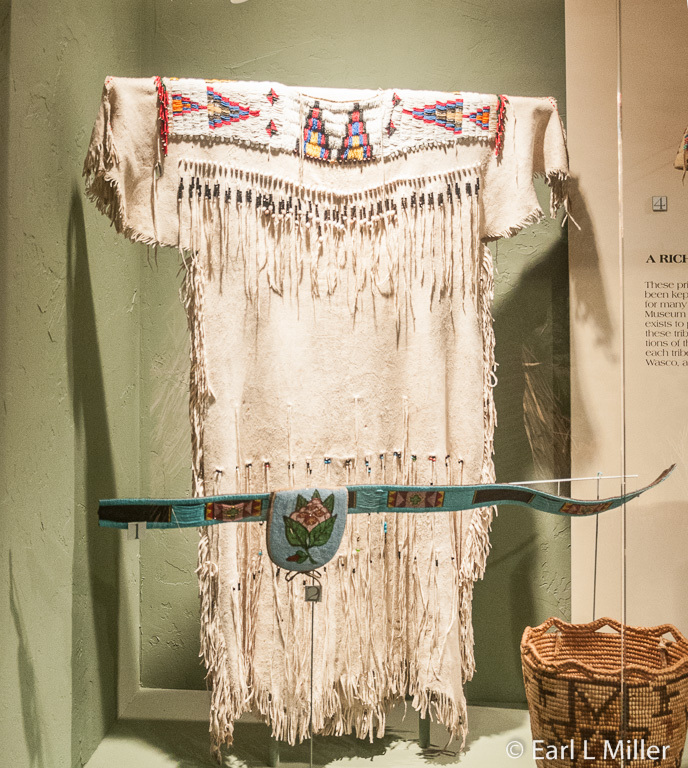 From June 25 through September 13, the exhibit is “Royal Legacy: Honoring Miss Warm Springs Past and Present.” It will relate the protocol, history, and responsibilities of Miss Warm Springs. 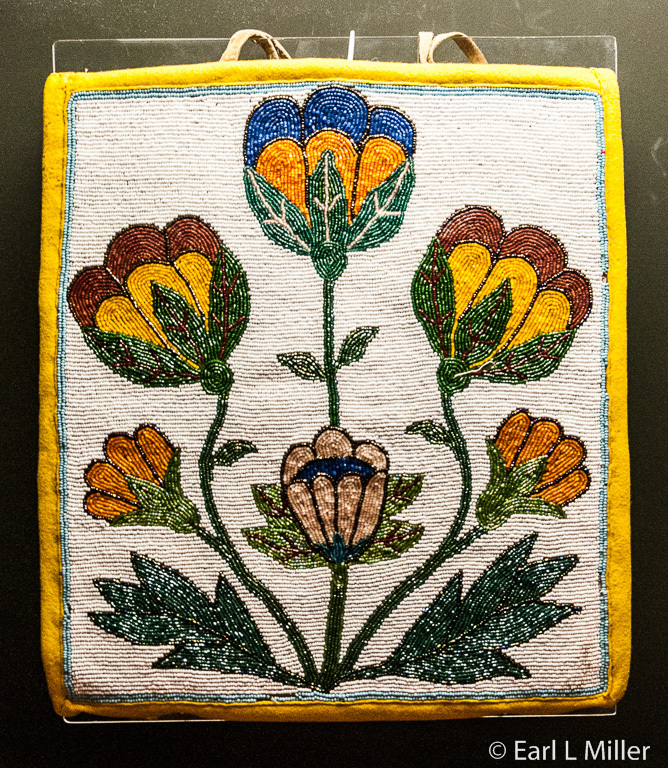 From October 22 through January 6, 2016, the museum’s temporary exhibit will be a juried art show of a variety of forms including beaded work. It’s the 22nd Annual Warm Springs Tribal Member Art Exhibit. Some art will be for sale. Across from the museum is the Indian Head Casino with 500 slot machines (penny, nickel, and dollar) and six blackjack tables. It houses a deli and the Cottonwood Restaurant. The Cottonwood is a great place to obtain an elk burger or taco salad on Indian fry bread. They also offer burgers and other sandwiches as well. 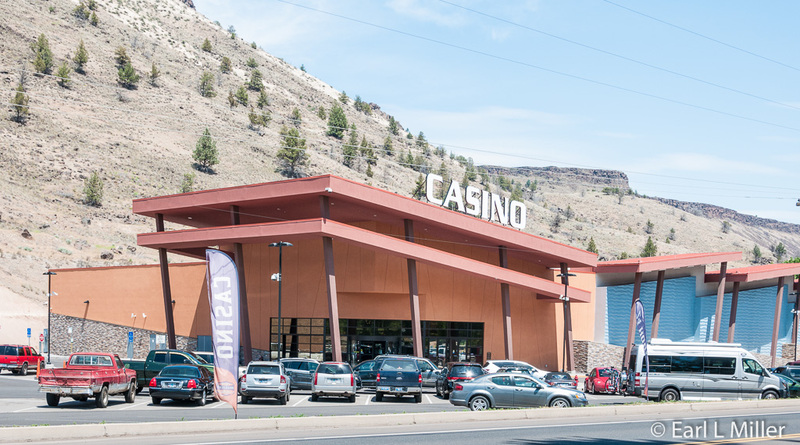 The exterior of the casino was designed to resemble the historic fishing scaffolds at Celilo Falls, integral to the culture of the Warm Springs tribes. The Museum at Warm Springs is located at 2189 Hwy. 26 in Warm Springs. Their telephone number is 541-553-3331. They are open Tuesday through Saturday 9:00 a.m. to 5:00 p.m. and closed Sunday and Monday. General Admission is $7. It’s $6.00 for seniors age 60 plus, $4.50 for students ages 13-18, and $3.50 for children ages 5-12. It’s free for those four years old and younger. Indian Head Casino can also be found at Highway 26. It’s open 24 hours a day, seven days a week. Their telephone number is (541) 460-7777.